NEW BRITAIN - The need for food pantry services is so great that it’s not unusual for clients of the New Britain Food and Resource Center on Osgood Avenue to walk from as far away as Willow Street and East Street every 15 days to get fresh produce, meat and a variety of staples, said site manager Michelle Torres. But due to funding cuts in recent years, the center was only open once a week and was not providing case management services. Thanks to a much-needed boost in donations from area foundations, however, the center is now up and running at full strength and preparing again to serve 750 families, encompassing 1,500 individuals twice a week with case management services. 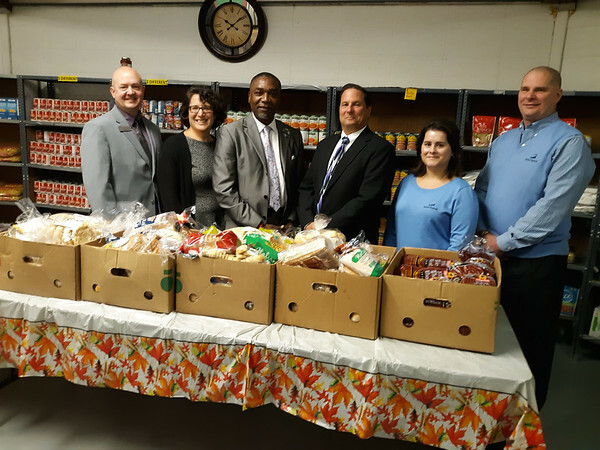 The New Britain Food Collaborative established the center at 460 Osgood Avenue in 2009 as a way of providing food and case management services to help people become financially independent. But in 2012 when the city cut the amount of federal Community Development Block Grant money given to fund the center, HRA has been struggling to keep the pantry operational. The pantry received a $2,300 grant from Foodshare for a new refrigerator and an increase in funding from the American Savings Foundation to $20,000, the United Way chipped in $12,000, the Community Foundation of Greater New Britain through a donor family provided $4,126 and Achieve Financial gave $2,000 through the Connecticut Credit Union Charitable Foundation. That was the funding the pantry needed to go back to two days a week with case management available so that clients can sign up for food stamps, Husky insurance, heating assistance and other services, organizers said. “If not for our donors and our volunteers, we wouldn’t be here,” Tricarico said. On a daily basis, Forbes organizes the pantry, making sure that volunteers pick up food from area grocery stores and deal with shipments from Foodshare, which offers lost-cost food to pantries throughout the state. On Wednesdays and Fridays from 1 to 5 p.m., the pantry allows people in need to pick out their own groceries with a volunteer. People can leave with as much as four bags filled with meat, fresh produce, baked goods and breads, dairy products and canned or packaged food. The new refrigerator allows staff to hand out Greek yogurt and fresh greens. The pantry was serving about 600 families during its reduced hours. Last Friday, people were already in line at 8:45 a.m. when Torres arrived for work even though the pantry wouldn’t open until 1 p.m. The center’s clients include people living in shelters and at the Prudence Crandall Center, which provides services for those experiencing domestic violence. Anyone who wishes to donate can visit the HRA New Britain website at www.hranbct.org . Posted in New Britain Herald, New Britain on Monday, 15 October 2018 21:17. Updated: Monday, 15 October 2018 21:19.